Volunteer Coordinator Will Ridlehoover braves the clark fork in the name of science! Adversity often inspires ingenuity. 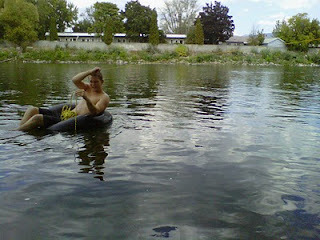 At least it did with Will and I on the Clark Fork last Sunday. Our weekly Stream Team outing focused on a section of the river just down-stream from the Madison Street bridge, and as with any wide river, the physical attributes of the Clark Fork presented certain challenges for data collection that had to be overcome. 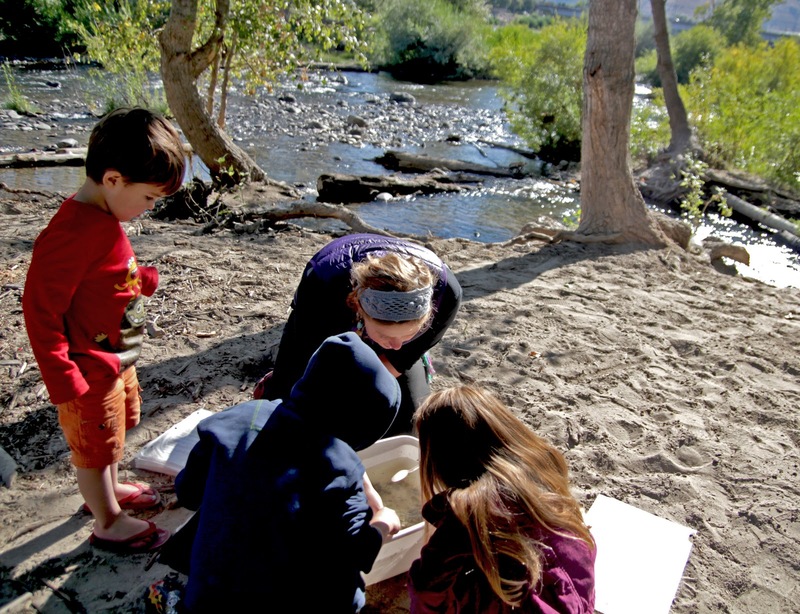 The Stream Team typically examines three major characteristics of the river. Chemical, biological and physical attributes are measured in order to give us an accurate picture as to the character and health of the river. The physical examination is comprised of factors such as water velocity, bank width, water depth and overall morphology or the "shape" of that river's section. All factors are easy to measure in small streams, but a several hundred foot wide river presents a few challenges of equipment and logistics. Luckily, Will and I were feeling particularly industrious that day, and he had some swimming trunks in his car. Typically the river's depth and width area easily measured with a depth pole and survey line respectively, but the fast moving and especially deep water combined with the extremely wide section we chose to measure made our typical methods impractical. So with a few handfuls of rocks inside of the nylon bag of a throw rope and the use of a sharpie I fashioned a makeshift depth gauge inspired by my youth on the Mississippi river and the endless reminders of how Samuel Clemens chose his famous pseudonym. In the mean time, Will paddled his way across the river with the aid of an inner-tube to fix a static line to the opposite bank and returned to begin the measurement process. Using the static line to hold his position in the river, Will worked his way across and dropped our makeshift depth gauge every "tube width" (3 foot 2 inches) and sounded off a reading to be recorded on shore. Sixty five readings later, we determined the width to be no less than 205.83 feet across and an average depth of around 3.5 feet. While this data was useful and important to record for many reasons that any WEN volunteer can explain, the process of collecting it was important for some reasons you may not expect. Namely, it was hilarious. As Will worked his way slowly across the clark fork, the rest of the team recorded the data and chuckled at the increasingly louder depth reports echoing across the water, and the impressed expressions upon the faces of passers by. We always have fun on Stream Team, but when afforded the opportunity to innovate, be bold, and a little bit silly with like minded folks on the banks of a neighborhood river the experience becomes that much more powerful and rewarding. I can't wait for next week, maybe we'll find a way to build a submarine from Tupperware containers and driftwood. The photo is one of my favorites. 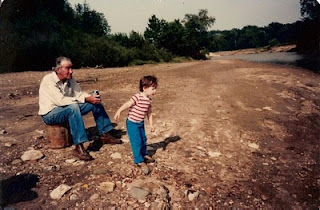 At no more than 5 years old, clad in blue corduroys and a striped red shirt, I stand off balance on the rocky shore and focus on counting the skips my carefully selected stone makes across the river. Just one skip. Behind me, on an upside down bucket, sits my grandpa. With suspenders on, and aluminum can in hand, he counts along with me. I'm fond of the photo for many reasons, but recently I was reminded how much it is simply a great capture of how lucky I was so grow up spending time at the river. The reminder came this week when a kindergartner, spoon in hand over a plastic tub crawling with aquatic macroinvertebrates fresh from the Clark Fork asked me: "how did we get so many crawdads in here?" The question was a perfectly rational question to ask. It is the fact that I had the responsibility and privilege of answering it that made me realize just how important the roles of WEN educators really are. And, in the absence of an organization like WEN in my home town, how lucky I was to have that role filled by my family when I was a kid. Growing up with a small river flowing through our family farm, and the great Mississippi charging south just a dozen blocks away from our house in town I had no shortage of opportunities to experience a river. But most importantly, my family was always there to introduce me to those opportunities, the fun of the river, and it's significance. But not every kid is as lucky as I was, and the opportunities in our own back yards mean nothing without guidance and introduction from thoughtful families, friends and community organizations. We had a dozen or so pairs of wide eyes, and highly raised hands at Clark Fork this week. But most importantly we had a dozen or so smiles as the four and five year old's caught and counted mayflies, stoneflies and caddisflies on the bank of an important river in their own back yard. Because while the youngsters may not retain the exact reason that these creatures are important to their ecosystem, they will certainly remember why the ecosystem was important to them on that warm September morning at the river. Last week, WEN had a great time leading students from C.S. Porter to the Bitterroot River. We taught them all about the biological, physical, and chemical aspects of their nearby river. Take a look at the day through this video courtesy of Clinton Begley! Ever wonder what it is like to be at the river with WEN? Now you can feel like you are at the river's edge with us by watching this great video by WEN's AmeriCorps member Clinton Begley.